This article discusses how to use CASCONCMD.EXE and CASCONATE.EXE to execute CASCON test and in-system programming applications from the Microsoft Windows command line. 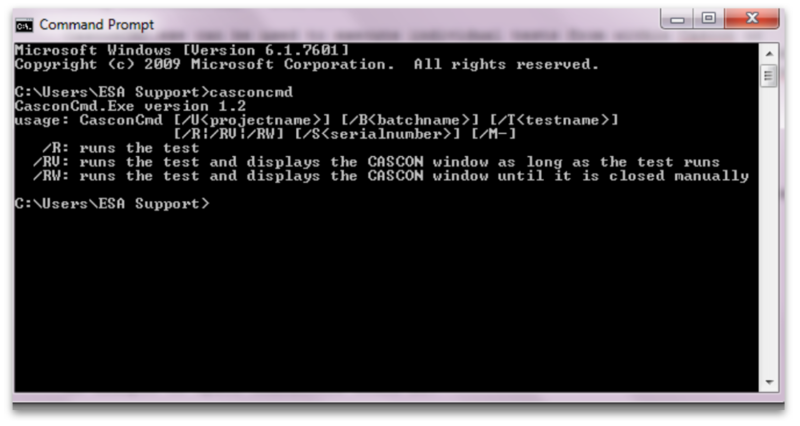 CasconCMD.exe can be used to execute individual CASCON tests or test batches from a DOS command line prompt. CasconCMD.exe therefore provides an easy to use method for executing CASCON based tests or batches without using the CASCON GUI. As of CASCON version 4.5.3, CasconATE.exe is available (separate license, designed primarily for use with system integration in mind) as an alternative to CasconCMD.exe. CasconCMD.exe is still provided as part of the standard CASCON installation. CasonCMD.EXE can be found in directory ..\CAS4WIN\Sys\Bin ( “..\” refers to the directory where the CASCON software is installed). If your project is on a network drive then it must be mapped and available. CASCONCMD can not recognize directories starting with \\. The CASCON project should be functional and hardware properly connected prior to executing CASCONCMD. CASCONCMD will not execute if another CASCON instance is already running. A “virtual pass” is possible if the controller hardware (e.g. 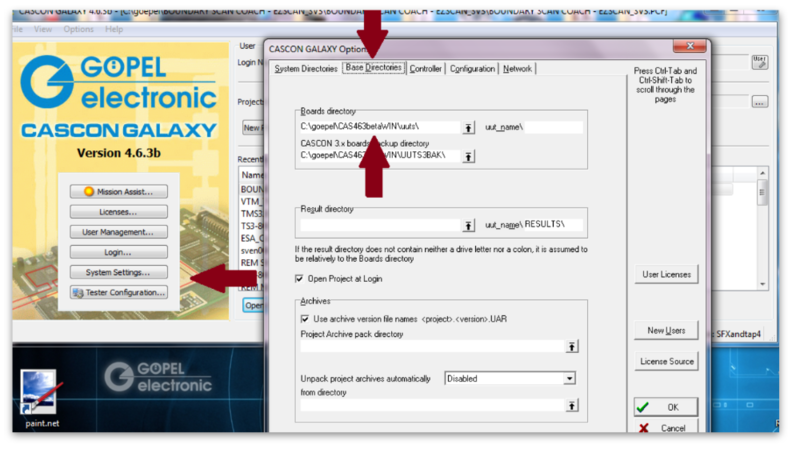 SFX controller, or ScanBooster) is not set up in CASCON, or if a “blank” Tester Configuration is used in CASCON (for software debugging purposes, in case the controller hardware is not available, for example). It is recommended to use either the /RW or /RV option initially in order to obtain visual confirmation that the tests are being executed. For more advanced functionality, please consider using the CASCON API (CASREFn32.DLL). In the case of missing path specification, the Projects Directory will be set automatically. If multiple UUTs are tested, the corresponding number of serial numbers must be specified. You can also start CasconATE without any parameters, in which case a Window would pop up displaying all possibly parameter options. Generally, a call may include several parameters. Processing is case-sensitive and is done sequentially from left to right. File path specifications must be put in quotation marks. See Application Note AE0004AB.PDF for more details (including error codes and diagnostic options).